A thrilling gorilla tracking and hiking adventure safari in Rwanda and Congo. Double mountain Gorilla tracking in Volcanoes National Park Rwanda and Virunga National Park, Lowland Gorilla trekking in Kahuzi Biega National Park and Mount Nyiragongo Hiking. Early in the morning after your breakfast, you will take a short drive to the Headquarters of Volcanoes National Park where you will be briefed by the park warden about the gorilla trekking activity. Gorilla trekking is a very interesting activity, which can last between 2-3 hours. The terrain is rough and at times muddy therefore the hikers have to be physically fit. Upon meeting the gorillas, you will stay with them for 1 hour before heading back to your accommodation for lunch and in the afternoon you will take a community walk around neighboring communities of the forest. Interact with the local people; learn about their way of living. Wake up early for your breakfast at your hotel, and hit the road with your tour guide driving to Cyangugu border to cross to DR Congo. Your will visit the national museum in Butare, the king’s palace in Nyanza and the genocide site and enroute lunch in Butare, the second largest city after Kigali. You will have clear views of Lake Kivu, Rwanda’s largest fresh water lake. Reach in the evening for dinner and overnight at Coco lodge (luxury), Orchid safari lodge(Mid range), Horizon Hotel (Budget). You will wake up early to go for your second gorilla trekking, the lowland gorillas of the DR Congo are found in Kahuzi Biega national park. You will also go for the routine briefing and thereafter proceed for the memorable adventure of tracking the lowland gorillas in Kahuzi Biega National park. The lowland Gorillas stay in bigger families as compared to mountain gorillas. After tracking, you will go for a nature walk in the Kahuzi Biega park and visit Tshibati waterfalls, visit bukavu town, Mbayo tea plantations, the research centre and the surrounding traditional homes. Return to the hotel for dinner and overnight. You will cross back to Rwanda, drive on the Rwanda Side until when you reach Goma town and cross back into the DR Congo. Dinner and overnight stay at Mikeno lodge or Bukima tented camp. Day 6: Mountain Gorilla trekking at the Virunga national park. Just like the previous treks, you will rise early, have your breakfast, go for briefing at the Virunga national park headquarters and proceed for your Congo mountain gorilla trekking adventure. You will spend 1 hour with the gorillas and transfer back to Goma. Just like the previous treks, you will rise early, have your breakfast, go for briefing at the Virunga national park headquarters and proceed for your Congo mountain gorilla trekking adventure. You will spend 1 hour with the gorillas and transfer back to Goma. After your breakfast, you will head to the park headquarters for briefing about the Nyiragongo hiking tour. You will then go for your 4-5 hour hike of mount Nyiragongo an active volcano. You will hike through the dense rainforest, until when you reach the summit. 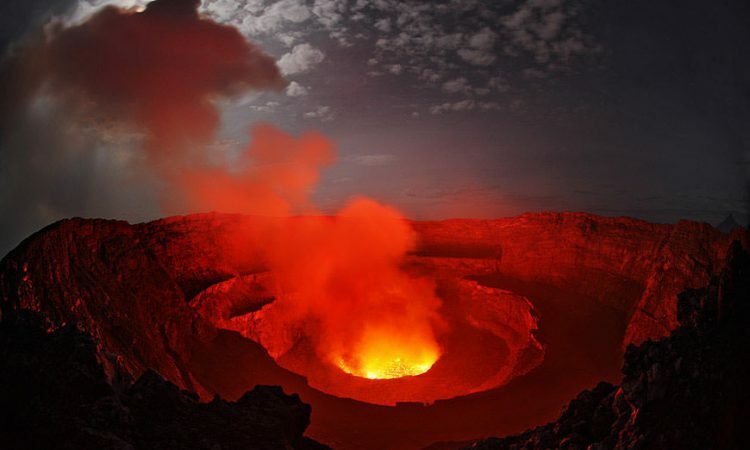 You will spend the evening enjoying the view from the crater as you watch the boiling lava. you will spend the night at one of the shelters at the crater. After breakfast, you will climb down from the Nyiragongo, transfer to Goma and then to Kigali airport or your hotel. End of tour.